We’ve been having a lot of fun in our Fatbell Revolution class lately. So much fun, in fact, that we just had to share some of our favorite Fatbell movements with you so you can join in on all the good times! Legs, Booty, Arms, Repeat. Side step and swing your way to a new & improved fitness routine. This movement can be deceivingly hard as you coordinate a lateral walk with a Russian swing but it’s well worth it! Trust us when we say your legs, booty & arms will thank you. This swing is guaranteed to make you feel like a fabulously coordinated fitness superstar! It incorporates a one arm swing with a loop around & in between each leg. Want to get even more superstar-ish? Grab a partner and try smoothly handing off the Fatbell in between swings. In the very least, it’ll be good for a friendly laugh (and hopefully no black eyes. Be careful, friends)! This movement is part mobility, part stability, part strength and a whole lotta badass. Combining hip hinge movement and spinal rotation creates a tough exercise that will challenge the whole body. Can we say core burner?? Weighted sit ups can be difficult on their own, but add in some unilateral movement and that’s where things get spicy! This movement has the added bonus, of not just core work, but also shoulder stability & strength. Just when you thought lunges couldn’t get any more fun, add a Fatbell! This variation is basically a jumping lunge and swing combined. Your heart rate will go up, your legs will burn and you’ll smile through the sweat because this movement is just plain ole fun! Can’t get enough of these movements? 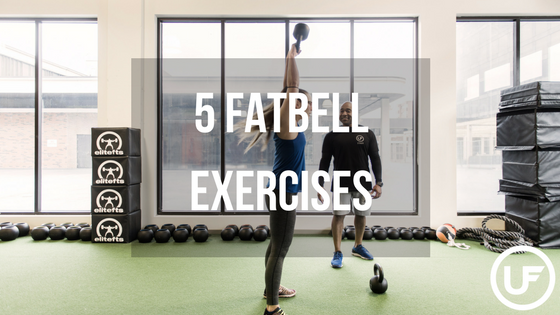 Join us for Fatbell Revolution to practice these exercises and even more!